The building blocks of life could have their beginnings in the tiny icy grains that make up the gas and dust found between the stars, and those icy grains could be the key to understanding how life can arise on planets. With help from students, researchers have discovered an important pair of prebiotic molecules in the icy particles in interstellar space. 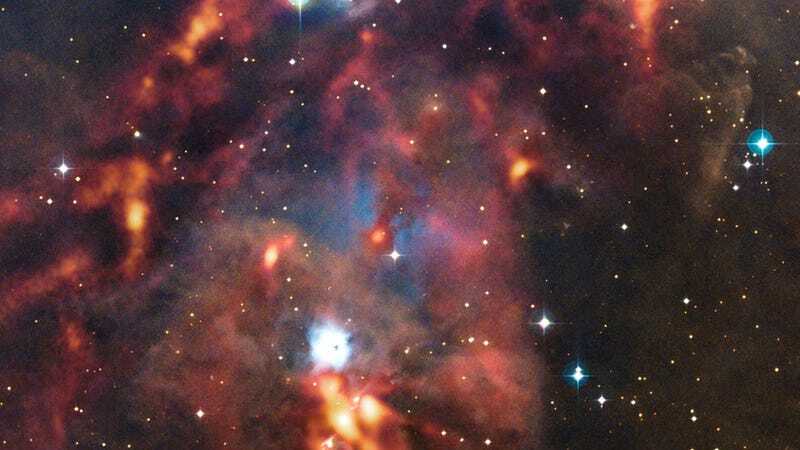 The chemicals, found in a giant cloud of gas about 25,000 light-years from Earth may be a precursor to a key component of DNA and another may have a role in the formation of an important amino acid. "We found the ultimate prebiotic of prebiotic molecules," said Anthony Remijan, of the National Radio Astronomy Observatory (NRAO). Using the Green Bank Telescope (GBT) in West Virginia, researchers found a molecule called cyanomethanimine, which produces adenine, one of the four nucleobases that form the "rungs" in the ladder-like structure of DNA. The other molecule, called ethanamine, is thought to play a role in forming alanine, one of the twenty amino acids in the genetic code. "Finding these molecules in an interstellar gas cloud means that important building blocks for DNA and amino acids can ‘seed' newly-formed planets with the chemical precursors for life," said Remijan. A team of undergraduate students participating in a special summer research program for minority students at the University of Virginia (U.Va.) conducted some of the experiments leading to the discovery of cyanomethanimine. "This is a pretty special discovery and proves that early-career students can do remarkable research," said Books Pate, a U. Va professor who mentored the students. This post originally appeared on Universe Today. It has been republished with permission.